The other day, I was in someone's home and just above the kitchen door I saw this little sign. Yeah, I even took a picture of it. 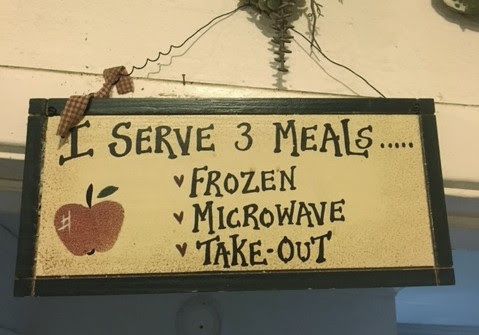 "I serve three meals, frozen, microwave and take out." Teresa and I enjoy cooking. We extremely appreciate a fine meal and all the effort it takes to create that meal. As I am chopping up vegetables or mixing a variety of amazing ingredients, I am always acutely aware of the seemingly endless varieties of food that God has created. He even gave us over 10,000 taste buds that inform us whether something is sweet or sour or bitter or salty. We have such a creative God! Just think of the millions of varieties of sea life, flowers, food, animals, insects etc ...it is seemingly endless. The intricate detail He gave to each. Every creation has it's own, specific touch that differentiates it from another. Even the way He created us...all different in many ways, yet all wonderfully and beautifully crafted by Him. Look around you, and you'll see His perfect creativity, in the birds that fly, the trees blowing in the wind, and in YOU! "And he has filled him with the Spirit of God, with skill, with intelligence, with knowledge, and with all craftsmanship, to devise artistic designs, to work in gold and silver and bronze."